Former student Latisha Hoewell's feature in the New York Times article "Earning a Degree, and Her Daughters' Admiration". In the article she discusses her journey to completing her degree in Forensic Psychology at the John Jay College of Criminal Justice. Last month, two of the JJ Psychology Department's incredible faculty members received major awards from the American Psychological Association (APA). Nadal is a prolific psychologist whose prolific contributions to the science and practice of psychology have far reaching impact. The important focus of his work and his successful efforts to make psychology accessible to the general public make him an ideal candidate for this award. In the eight years since he received his PhD, Nadal has been the sole author of four books, co-authored over 30 refereed journal articles, and numerous other publications, including book chapters, encyclopedia entries and monographs. He has brought his academic expertise to educational videos, expert witness testimony, and law enforcement training. Notably, Nadal goes beyond traditional methods of dissemination to bring psychological research into public consciousness. His articles for popular websites (e.g., HuffingtonPost.com and Buzzfeed.com), online talk show and invited media appearances demonstrate the relevance of his work and his ability to translate science to a public audience. Kassin is a distinguished professor of psychology at the John Jay College of Justice and fellow of the APA and the American Psychology-Law Society (APLS; Division 41). For the past three and one-half decades, he has dedicated his life to understanding how and why suspects confess to crimes they did not commit, how jurors and judges react to confession evidence in the courtroom and how individuals’ behaviors and decisions can be corrupted by such evidence. This dedication has prompted changes in policies and the law in the interrogation room (e.g., videotaping of interrogations) and the courtroom (e.g., admissibility of expert testimony). Of importance, Kassin’s research has also influenced policy and practice. His scholarship epitomizes the translation of science into policy. He has been cited by the U.S. Supreme Court (Salinas v. Texas) and the APA has submitted six amicus briefs to the courts on false confessions, in large part due to Kassin’s efforts and involvement. Kassin also, on occasion, serves as an expert witness to educate the judge and jury about false confessions and the risk factors that can induce them. His expertise is commonly sought out not only by defense attorneys but also by the media and documentarians (including the full-length movie, "The Central Park Five"). Thus, his body of research and related efforts of translation have resulted in a new understanding of interrogations and confessions for academics, legal practitioners, and the general public—this is advancing psychology in the public interest. The Department of Psychology at John Jay College invites applications for TWO Tenure Track Faculty Positions at the Assistant or Associate rank, to begin Fall 2018. Successful candidates are expected to bring enthusiasm and demonstrated commitment to teaching and working with diverse populations of students, develop and maintain an active research and publication agenda, have the potential to obtain external funding, provide strong mentoring of students, and participate actively in public and professional service. The Psychology Department has significant strength in Forensic Psychology and seeks strong applicants with complimentary interests from the following areas of psychology (doctorate required): (1) CLINICAL PSYCHOLOGY (with forensic interests and experience); (2) COGNITIVE or DEVELOPMENTAL PSYCHOLOGY (with psychology & law interests). Faculty will perform teaching, research and advising duties in area(s) of expertise; share responsibility for committee and department assignments including administrative, supervisory, and other functions. John Jay College of Criminal Justice, a senior college of the City University of New York (CUNY), is an internationally recognized leader in educating for justice, committed to the advancement of justice and just societies. It is a public liberal arts institution that enriches the learning experience by highlighting themes of justice across the arts, sciences, humanities, and social sciences. Located steps from Lincoln Center at the cultural heart of New York City, the College offers Bachelors and Masters degrees and participates in the Doctoral programs of the Graduate Center of the City University of New York. Now under the leadership of its fifth President, former U.S. Assistant Attorney General, Karol V. Mason, the College has experienced unprecedented faculty hiring, an expansion of its curricular offerings, and the opening in 2011 of a new 600,000 square foot building with a black-box theater, state-of-the-art lab space, a moot court, and a variety of virtual learning settings. Ph.D. or equivalent degree in area(s) of expertise. Also required are the ability to teach successfully, demonstrated scholarship or achievement, and ability to cooperate with others for the good of the institution. The college seeks faculty members who thrive in a multi-cultural, collaborative academic environment and are committed to both access and excellence in higher education. Salary commensurate with experience. CUNY offers faculty a competitive compensation and benefits package covering health insurance, pension and retirement benefits, paid parental leave, and savings programs. We also provide mentoring and support for research, scholarship, and publication as part of our commitment to ongoing faculty professional development. Once registered or logged in, candidates should submit a cover letter, curriculum vitae, statements of teaching and research interests, and teaching evaluations if available. Three (3) reference letters should be emailed to: PsychologySearch@jjay.cuny.edu, with the candidate’s name in the subject line. Inquiries about the positions can be directed to the same email address. The Psychology Department currently has 40 full-time faculty members committed to strong teaching and mentoring of our diverse student body. The Department offers an undergraduate degree in Forensic Psychology, with roughly 2000 majors. Our well-established Master’s programs in Forensic Psychology and Forensic Mental Health Counseling enroll more than 400 students from around the country and the world. 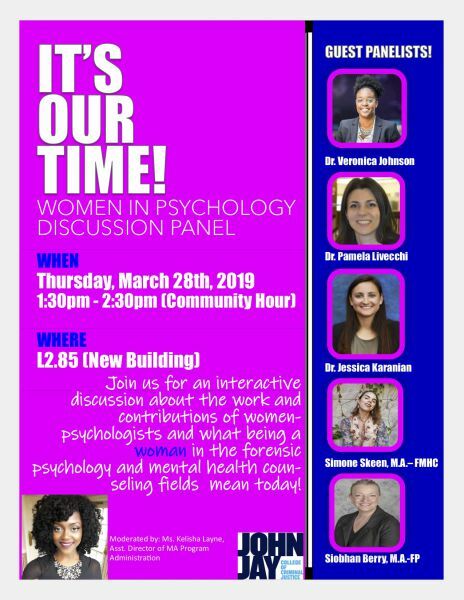 The CUNY Graduate Center doctoral programs in Psychology & Law and Clinical Psychology @ John Jay (APA accredited) are housed at John Jay as well.